Today is a busy day for me. I have company coming over to celebrate the occasion tonight much like many other diabetics that I know are doing. At first when I decided I wanted to have a party I wasn't sure if it was a little too strange of an idea. After realizing how big this was, I knew I was doing the right thing. Around the world, countries light up special monuments blue. I would love to one day see one and now knowing that the Niagara falls is being lit up I will defiantly head there next year. I think it is one of those things that brings diabetics all around the world together to let each other know we are not alone. To me, it means triumph and power to those who may feel lost in the disease. It's not an easy disease and it is a 24 hour battle. Babies, toddlers, children, teens, adults, seniors, you're not alone. For World Diabetes Day I want my guests and people who look at the pictures to realize how important support is to me. Without my close friends and family I wouldn't be as successful with diabetes. Like mentioned many times this isn't something you can do alone. The first symposium I ever attended was in Hamilton. It was the first time I ever saw Chloe Steepe, previously hearing about her in the emergency room. It was one of those days that I think to myself, if I didn't go where would I be today? I also met Anne Martin that day from JDRF who has been amazing to me since day one. Doing the Mud Run had to be one of the most exciting things I have ever done and I can't wait for next year. Michelle, Clinton, Mom and I all participated in the Mud Run in Toronto with Connected in Motion. Our shirts were empowering themselves with, "Down and Dirty with Diabetes across them." Team KK, the amazing team that was created for the Walk to Cure Diabetes 2009. With out all of you, I wouldn't have had such an outstanding team. Team KK inspired me to be more,do more and really allowed me to continue on. This team made me realize just how much the friends and family I have love me and support me. Seeing George Canyon was an amazing experience that I shared with my Aunt Lisa. It was amazing to hear a celebrity tell their story about living with diabetes. Also to sit with other diabetics made you realize that your day to day struggle is shared by many. Speaking at Fanshawe about diabetes was very inspiring. Just being asked to do something like that made me extremely happy and excited. I really took that moment in and realized how lucky I am to be where I am today. Without Melanie Baker I wouldn't have gotten such an amazing experience like that. Going to special events with tickets provided by JDRF has really been fun! First were the tickets to Canada's Wonderland that Sam and I enjoyed. I then recently got tickets to see Radio City Christmas Rockette which was a great time that I shared with my Aunt Lisa and Grandma. I also want to reflect on my three biggest projects, my blog, scrapbook and Helping Hands group. I really take pride into these three things and I am so lucky that I have people interested in all three of them. This blog of course has been running since March, and I try very hard to write every day but of course like everyone else, I have busy days. The scrapbook is a collection of everything I mentioned previous plus more. It is something that I love to take around to the hospital, family gatherings and when I have friends over. 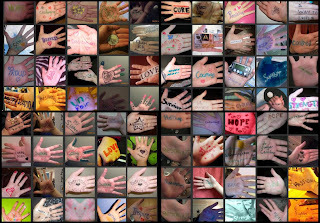 My group Helping Hands, was started in October and now has 184 members and 84 pictures uploaded. It really is inspiring every time I look at a hand. There are so many other things that diabetes has given me and that I would love to reflect on. I must admit I reflect about diabetes often. Today is a day of celebration. Celebrate diabetes for the good things it brings you, hope, inspiration, and love.